The earliest memory on Galactica I have is that in the summer of ’84 or ’85, I refused to go swimming with my friends on a hot Saturday afternoon because Galactica – the original series – was shown on TV. I preferred to spend the day indoors, watching TV for not even an hour, instead of having fun with my friends at the pool. I remember that because of this series, I bought all LPs of Rick Springfield, who had a part in the series. 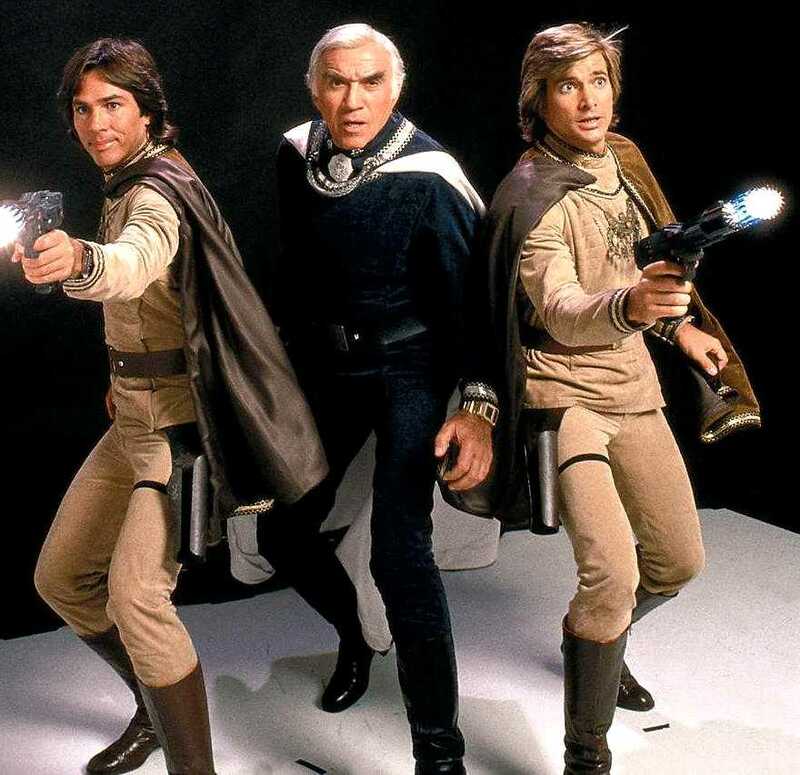 What I can’t remember, however, is how often I watched the single Galactica movie that I had remembered to record on Video tape – the one in which they meet the Pegasus and Commander Cain. It must have been a few dozen times over the years, and the actor who played Cain was – that was at least my opinion – probably one of the *very* few ‘older’ men I ever found attractive, even back then when I was just 13 or 14 years old. 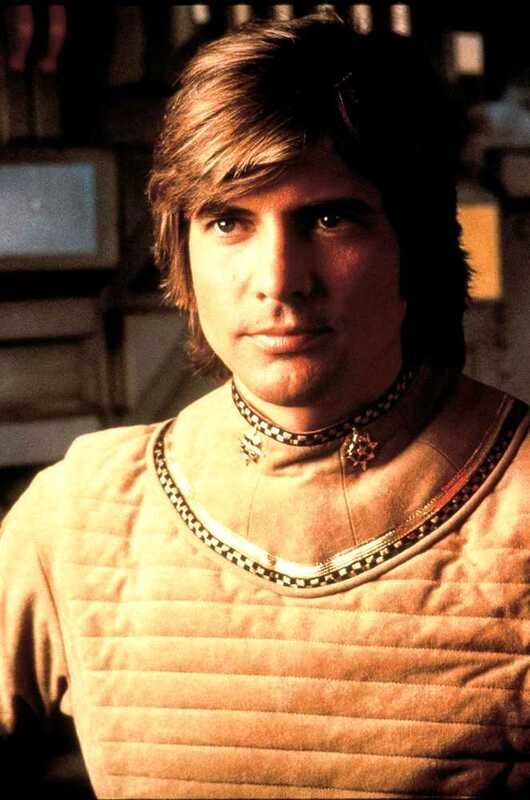 About two years ago I found out that Galactica would be turned in a new series, which I was quite excited about; but when I saw the first picture titled ‘Starbuck’ and saw she was nothing like A-Team’s ‘Face’ Dirk Benedict, I almost immediately lost my interest in the series before even having seen a single episode of it. I couldn’t imagine how a woman would be able to replace him. When the first episode of the new Galactica finally aired on TV a few weeks ago here in Germany, I thought I should at least give it a chance. As the series replaced Stargate on Wednesday evening, I practically had no other chance but watched it. The first episode didn’t quite get me. I still spent my time comparing between the old and the new series, being extremely disappointed how the actors of the original series were ‘replaced’, in my opinion. 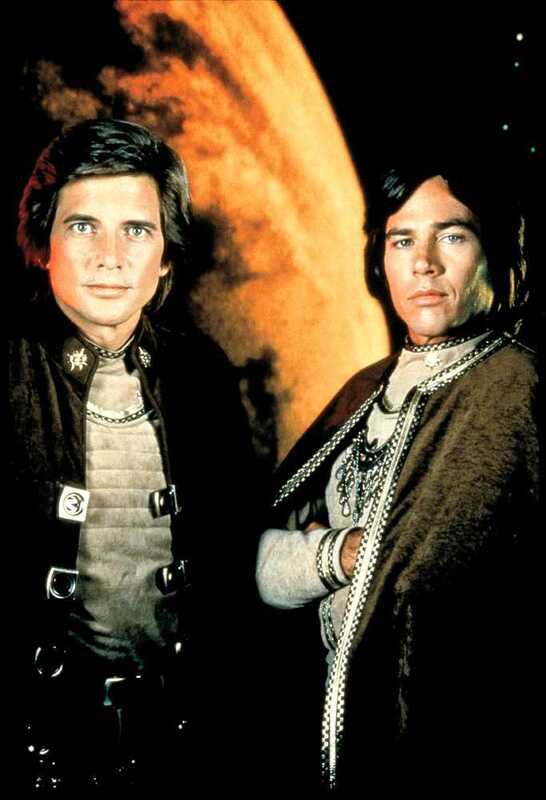 I didn’t manage to realize that the new Galactica wasn’t supposed to be a refreshed old series; but I guess that this is a problem many people who know the old series have when watching the new one. 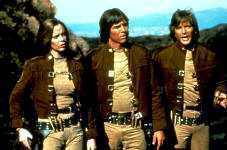 That changed when I saw the second episode, “33” – the one in which the Galactica and fleet are tracked down by Cylons every 33 minutes. This particular episode made me marvel at the new series and rethink my opinion about the old one for a lot of reasons. I was totally taken by the makeup artists of the series. In “33”, everyone is supposed to suffer from the fact that everyone has been awake for approximately over a hundred hours. Everyone’s faces look grey, old, pale; the eyes sunken in; the skin glistening from dry sweat as no one had any chance to take a shower for almost a week because they were busy fleeing, fighting, surviving – they look as if they really didn’t sleep for a very long time. The old series would have depicted actors who didn’t have a clean shave for a few days, but this new series did so much more. 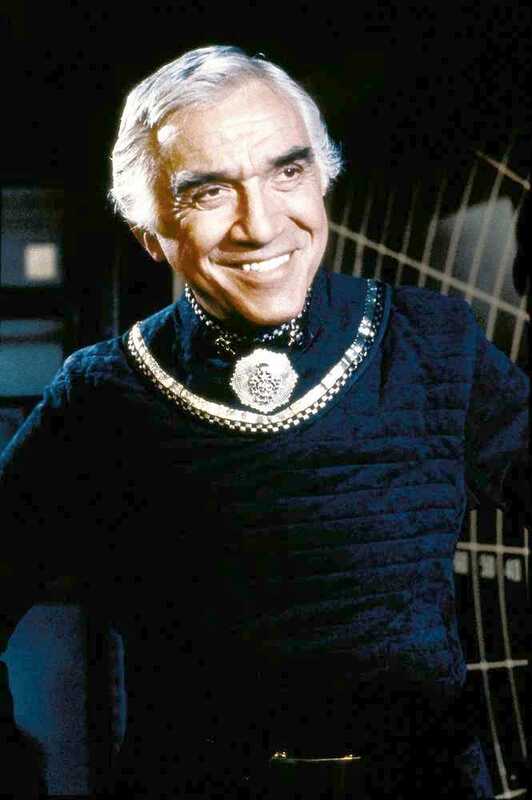 I wouldn’t be able to imagine Lorne Greene’s Adama being impatient, stressed or anything like that – but Edward James Olmos’ Adama manages to be all this and an obviously extraordinary leader of his people PLUS being tired at the same time – and all of this in a believable way. After I had seen that episode, I started to think about the new series. 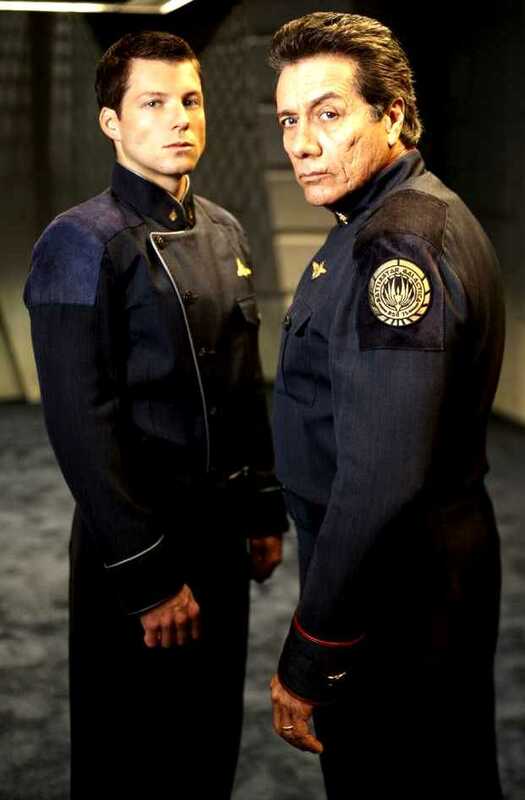 The old series had nicer uniforms and sets, yes. But think about it: wouldn’t leather jackets (and new looking ones for that – all the time!) and boots for a whole flying crew be somewhat strange on a fleet that owns no animals to get such leather from? Wouldn’t it be much more likely that the crew would wear easy to clean and protective high tech materials, as the crew in the new series does? The old series was what a Science Fiction series in the 80s was supposed to be: Entertaining, not meant to make the viewer think. One should be able to follow the series without having seen too many previous episodes. The actors had to be clean and easy loveable, and one could distinct a ‘good’ character from the ‘evil’ ones by merely looking at them (just remember Baltar’s face in the old series – it was always lit either from the side or – most of the time – from the bottom, giving him a devilish appearance). The Cylons, even if technically so advanced, were easily ruled out by humans, even if it has to be assumed that a machine would have by far faster reactions in combat than any human being. The new series is more realistic. It deals with the problems of being cut off from supplies from one day to another, with the preciousness of a single life if all that’s left are a few thousand. It doesn’t care if the actors always look ‘attractive’ but, for the sake of realistic depiction, in fact makes them look rather unattractive most of the time. 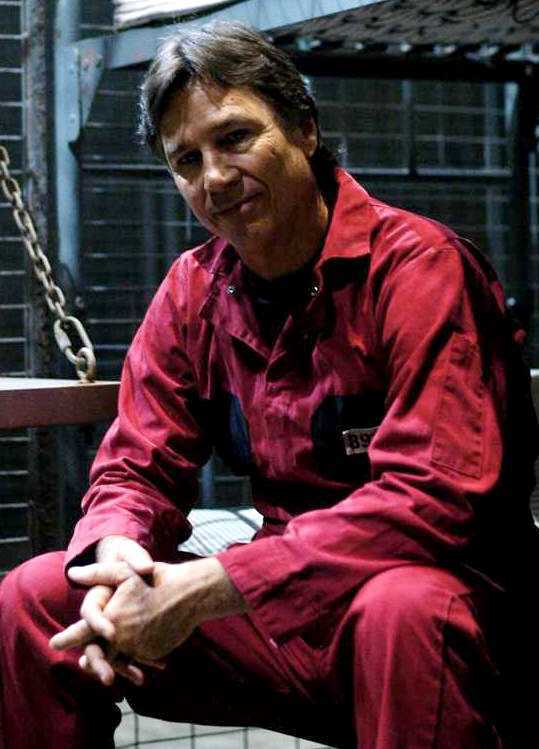 It especially deals with the strong will of humans to survive, and doesn’t underestimate the threatening of the Cylons by merely reducing them to the shiny polished tin cans with a red ‘Knight Rider’ light as which they were depicted in the old series. 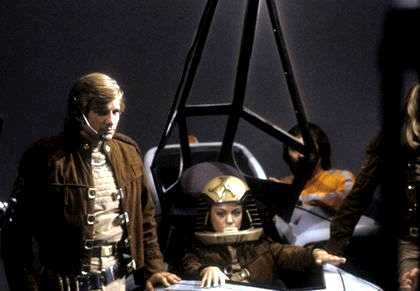 The sets on the old ‘Galactica’ showed practically no wear and tear, no matter through how many battles it went – in the final scene of each movie or episode, the Galactica was in perfect condition again. One would have to wonder how that could be possible; where would they get the resources to repair such things from (same goes for the giant washing- and dry cleaning machines for their uniforms, which were always in perfect condition – even if they were worn all the time, in service or not). 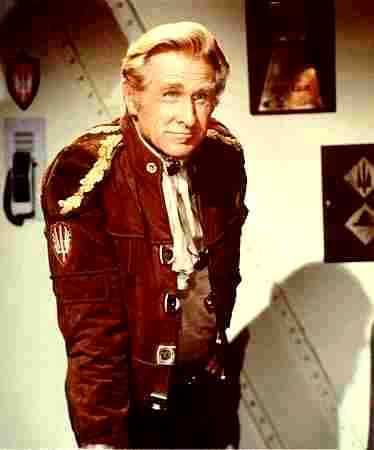 The new Galactica is old, worn out, dirty, not so nice. Even if the outer shape is similar to the old one, it looks almost completely different on the inside. 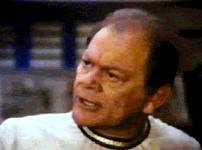 The people on the new Galactica have worries; like where to get water or fuel from, and the ‘president’ even worries about an exact count of each and every life in the fleet. Speaking of which – the President. 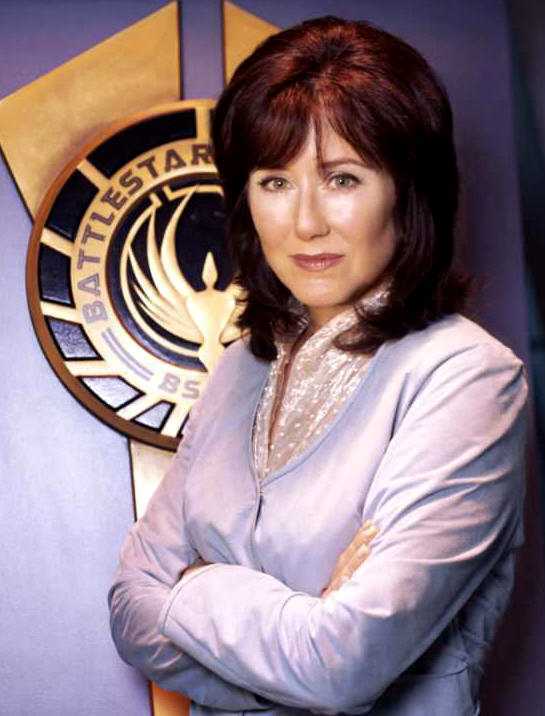 I think President Roslin is what Adama was in the old series: The calm pole in the middle of the storm. Her presence in a scene is so soothing that I have problems not falling comfortably into sleep whenever she shows up – and that’s definitely not a compliment that I would give to each and every actor. I, even if I’m watching the show just on TV, am soothed by her presence, and I guess that means a lot. Occasionally I find me asking myself if she’s not TOO calm to be a leader of the last surviving members of human civilization. About herself, about the fleet, about her position, about her ability to properly represent the opinion of a whole fleet. But she does so with an open mind, with wide open eyes, practically completely ignoring her own, fragile condition and is by doing all this the exact opposite to the teeth-gritting Adama who tends to always see the world through the eyes of a commander on the battlefield, which is, of course, also a good point to start from. If Adama can save a few lives by sacrificing many of which he isn’t sure that he can save them, he will do so (First episode: Adama flees with the fleet instead of searching for further survivors). If Roslin could possibly save many lives by risking a few, she will try this (Same episode: She tries to convince Adama to search for more survivors, while he insists on fleeing). 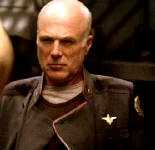 Occasionally those positions change (in ‘You can’t go home again’, Adama risks the whole fleet for Starbuck’s life, and Roslin reminds him of his responsibility for more than one pilot but a whole fleet of human survivors, even if he loves said pilot like the daughter he never had), but most of the time, it’s just like that. Both of them are absolutely right in their decisions from their viewpoint and probably also from the viewpoint of a thinking fan of the new series. 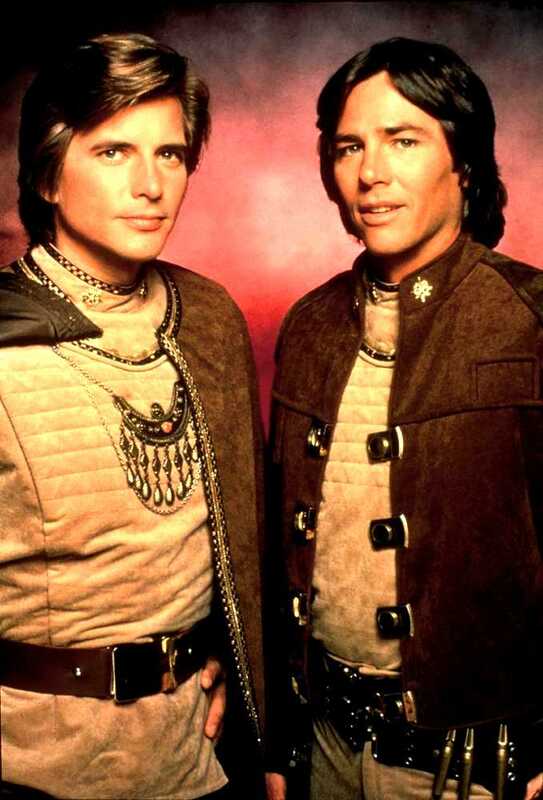 Now if they would manage to mix their opinions and decisions and meet somewhere in the middle, what a fine, wise ruling couple over Galactica’s fleet would they be. Unfortunately, from what I have seen so far from the series and what I have read about upcoming episodes which have not aired in Germany yet, this won’t be the case for a long time to come, and I find it questionable that it will ever happen. 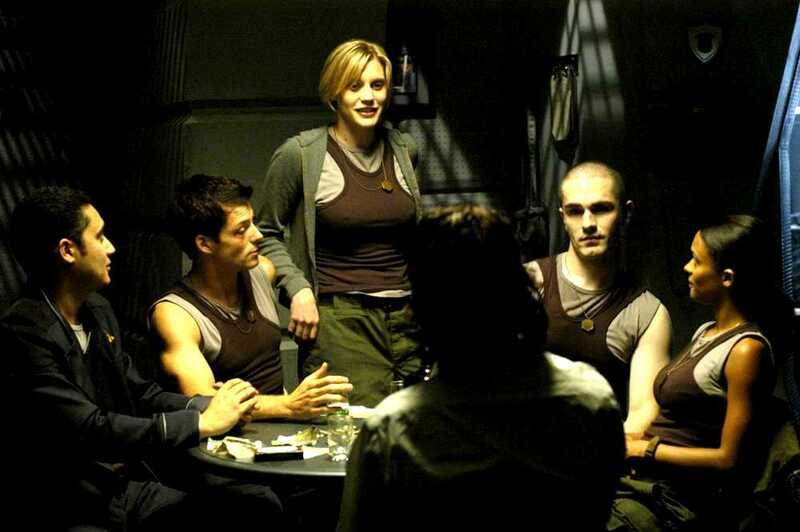 And then there’s Starbuck, the character that made me love the old and hate the new series at first. Kara ‘Starbuck’ Thrace is, at first sight, a smoking, dirty pilot gifted with the talent to fly anything that can eventually elevate from the ground. Unfortunately, when I had my first encounter with her (as described above) I just saw a misplaced girl in a role that I – at that point of time – could only see fit by a Casanova whose abilities as a pilot are never as obvious as Kara’s are from the beginning, but his talent for getting into trouble – especially because of women – is. She doesn’t get into trouble for choosing the wrong lovers, but for her temper. She tries so hard on doing a good job as a pilot that she occasionally seems to forget that she already IS the best pilot. She would have no need to show her male colleagues that the ability to be the best pilot (or even just a ‘good’ pilot) doesn’t depend on a part of the male body that she is so obviously missing, so she spends a good deal of her time trying to compensate said missing body part with a rather male behavior which she wouldn’t need – but which, admittedly, suits her role rather well. Kara is – somewhere under that dirty, male disguise she carries around almost all of the time – so beautiful – not only mentally, but also physically – that I could cry each time I’m looking at her. She’s probably more female than any other survivor – she’s extremely vulnerable, emotional and caring, but tries to hide that most of the time – my kudos to the script writers AND a brilliant actress who so greatly manages to play a role which is probably one of the most difficult in the whole series. I know that short haired women who wear dirty tank tops, smoke fat cigars and tear the living flesh out of alien space ships that ‘stink like toilets’ and which sre then used to fly back to the Battlestar (from “You can’t go home” – not without obviously and miraculously pulling out a bucket of yellow paint from her flight suit and paint her name artistically to the vulnerable bottom side of said alien ship, which must have been much harder to paint with an injured leg than the top side and which would also have been less vulnerable, considering that someone who would follow her would see that top side far earlier than the bottom…) are probably not the exact common definition of ‘beautiful’, but for whoever-might-be-responsible’s sake, she *is* beautiful. She’s just as beautiful and attractive as the male Starbuck was in the old series, but on a level that I would call far more intelligent. 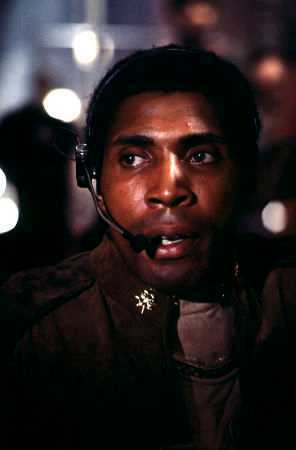 The old Starbuck was a hormonally steered Casanova who could easily be distracted with a short skirt from whatever important thing he was doing – on everything else, he seems to have relied on Apollo’s superior abilities as a pilot, fighter and – occasionally – as a soothing pole if he was in relationship trouble again. I’m exceptionally glad that the new Starbuck is a clever woman who just has problems with her temper from time to time, and that makes me love her a lot. 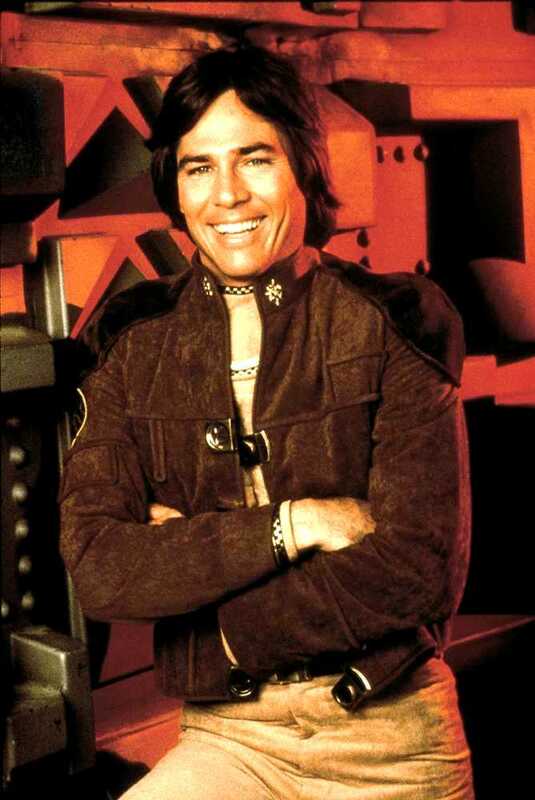 What I never understood in the old series was the fact that the Cylons, who wanted to destroy all human (and alien) life in the universe, accepted Baltar as a human ruler (or at least commander on one of their ships. 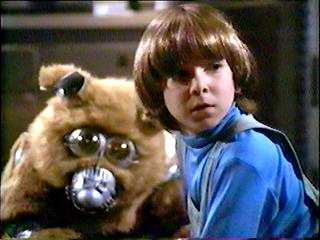 Even less I understood Baltar’s ambitions to kill his own species. The new Baltar is probably a brilliant scientist, but has extreme problems with his visions of Number Six (well, who wouldn’t?). 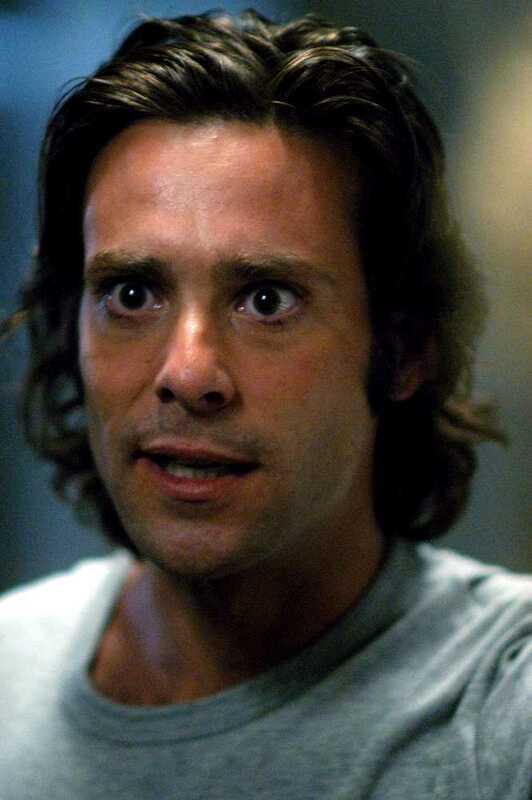 I am quite sure that the new Baltar went mad as soon as he found that he was at least partially responsible for the destroying of Caprica, and ever since then, he’s probably just trying to survive (and probably hopes that the nightmare of the new war will soon end, making him wake up next to a beautiful and not at all cylon Number Six…). I am, however, not sure if Baltar isn’t thinking that he’s dreaming everything that happens. 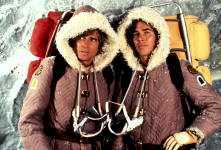 I am just a bit scared of the episode (or rather – the movie) from the old series that I have seen so often – the one with the ‘Pegasus’ – transformed into the new series. 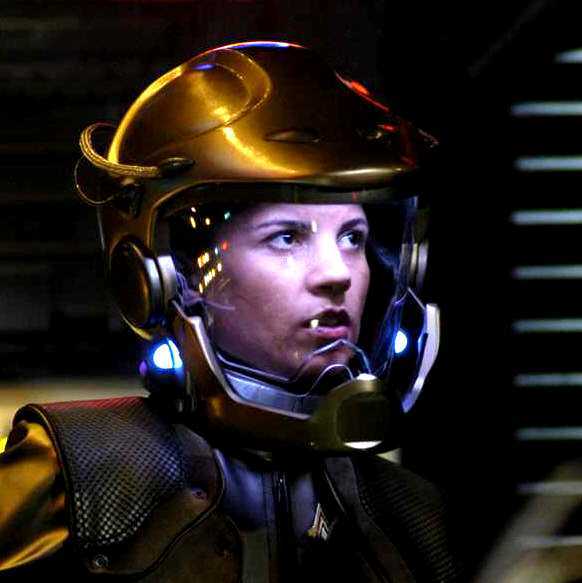 Having read Marc Carlson’s interesting notes on the Galactica timeline, I know that Commander Cain will be female now, and that she is probably also a brilliant battle commander, but with a brutal touch that I don’t quite like so far. 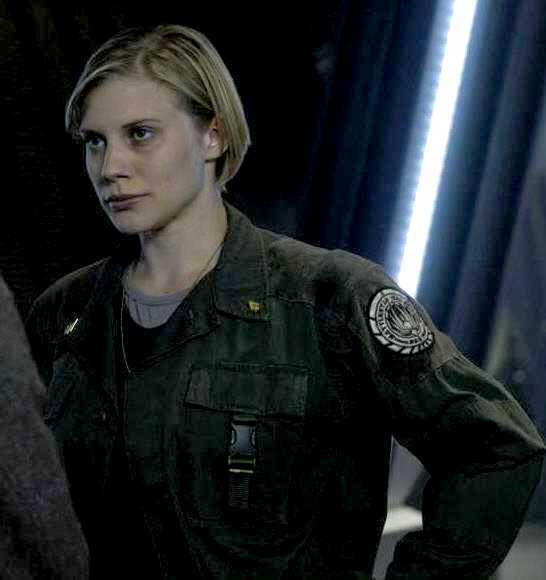 However, since I found that I was wrong about my initial opinion about Starbuck, I still have hope to be positively surprised about Cain’s role in the new series. 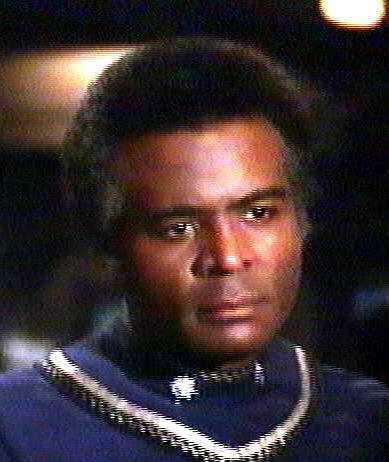 Brother of Lee ‘Apollo’ Adama, son of Commander Adama and lover of Kara ‘Starbuck’. Died 2 years before the war in an accident which he obviously caused because he wasn’t such a talented pilot. 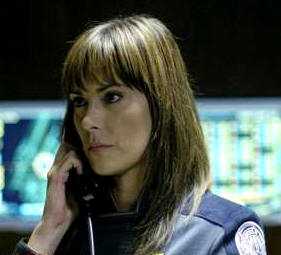 Female Cylon with human appearance. 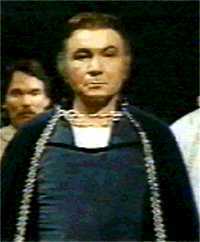 Had an affair with Dr. Baltar and continues to appear as a vision visible only to him. 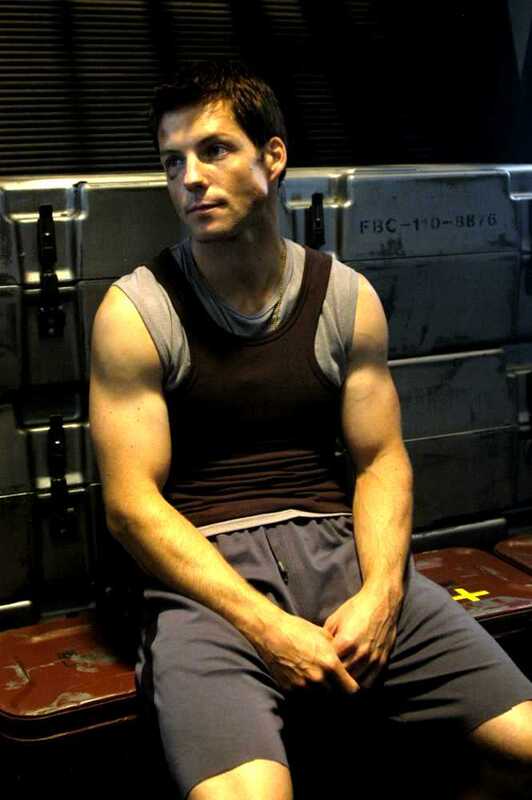 Pilot stranded on Caprica when the war started. All consist of beige trousers and beige shirts, edged with golden trims. The flight suits have those brown suede jackets and somewhat Egyptian looking helmets in addition, and the ceremonial suits are worn with a cape – sometimes with, sometimes without the jacket and / or some kind of necklace. The ‘Bridge’ and ‘Commanding’ staff on the Galactica (see exception for Pegasus below) are wearing navy trousers and shirts edged with silver trim, again the ceremonial version of their clothing is completed with cape and the occasional necklace. 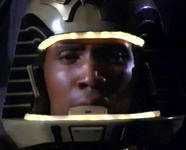 I could never understand the concept of a helmet that’s obviously lit from the inside, casting light on the face of the wearer (except, perhaps, from the cinematographic point of view to make the faces of the actors visible…). This would cause the same effect as if you would stand in a room with bright light and would try to look through a window which leads to a place where it is dark: You would only see your own reflection in that window. The helmet’s shield would act as that mirroring window, your bright lit face as the mirrored image – and it *is* dark out there in space where they are supposed to fly with those helmets, right? The necklace which is occasionally worn with the ceremonial uniform doesn’t seem to depend on the rank or person – as the last two pictures show. Obviously, the clothing rules are not very strict. 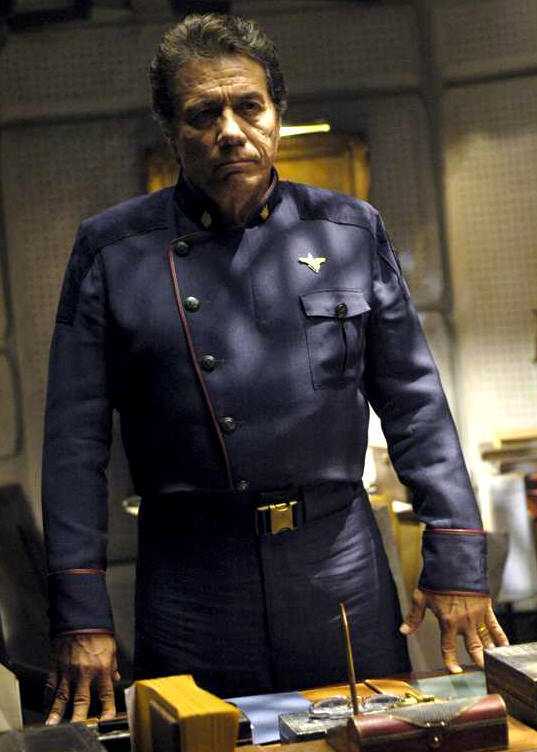 ‘Pegasus’ Commander Cain wears basically a staff uniform of which the shoulders are decorated with golden laurel leaves instead of the navy suit. 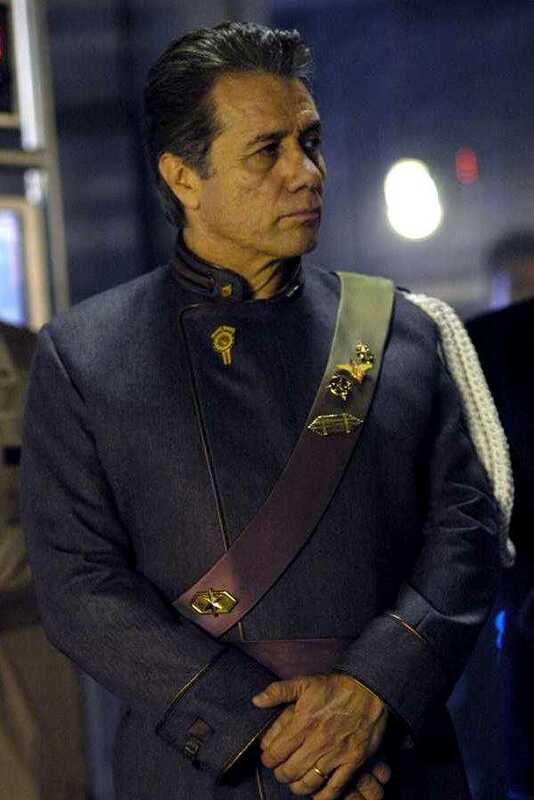 In the new series, the clothing rules seem to be more strict: Admiral Cain wears the same clothing as Adama (which should be the case in military commanding structures). …and now please anyone tell me why I feel so freaking old after recently listening to the conversation of two teenagers in the subway about how attractive Apollo is and how ugly ‘that prisoner’ (“Tom Zarek” in “Bastille Day” – a guest role for Richard Hatch who used to play Apollo in the original series) was…?